If I could offer one sage piece of advice from the last four weeks of my existence, it would be that when at all possible, do not start a new job two weeks before you move house. And if I could offer a second piece of advice, it would be to try not to have your office move buildings two weeks after you move house. During my time away from the blog, I had a chance to reflect on many things. One of the things I realized is that when your life is in turmoil, it’s reassuring to fall back on a few reliable things that you know will bring you joy. As you age, you come to have what I refer to as a set of “quiet obsessions” – i.e., those topics which are endlessly fascinating to you and which you can never learn enough about. Indeed, the very fact of revisiting them becomes a touch stone of sorts. These quiet obsessions are the inverse of having a hobby when you’re grown up – (something I also advocate) – but equally useful. Rather than keeping you fresh through experimentation and change, the quiet obsessions serve to anchor you in who you are and provide some continuity and depth in your identity. I have lots of secret obsessions, but here I’ll just list five. Have a think (great English expression!) about what topics never tire you out and leave them in the comments section. I love learning about other people’s quiet obsessions! 1. Political conflict. I’m not sure where this obsession comes from, but I have a deep-seated fascination with intractable political conflicts, of the Israeli-Palestinian, Northern Ireland, Bosnian variety. I’m drawn to this topic in films and I’m equally drawn to it in books. And I’m especially drawn to first person narratives about the aftermath of political conflict, like this moving story about a bar in Queens that never managed to rise above the Balkan conflict. There’s something achingly compelling, I think, about political stalemates that endure, leaving their indelible bruises along the way. Yeah, I know. It’s bleak. But I can’t get enough of them. 2. Watergate. Also political – but with a happier ending – is my obsession with Watergate. I am one of those people who could listen to the late NPR correspondent Daniel Schorr talk about the Watergate scandal forever and a day. I’ve also seen All The President’s Men God knows how many times. Imagine my delight, then, when I read this gem: an article in a recent New York magazine revealing how Washington Post editor Ben Bradlee secretly harbored some doubts about the Woodward/Bernstein narrative about Watergate all along. For a Watergate junkie? I seriously could not put this article down. 3. Bilingualism. For as long as I can remember, I’ve been fascinated by foreign languages. I bought a How To Learn Russian book when I was in second grade. I majored in languages in college. And I’ve always been particularly envious of those friends of mine who grew up speaking two languages. So whenever I read a new study touting the benefits of bilingualism, I”m all over it. 4. Sibling relationships. Ditto new research on sibling relationships. I firmly believe that sibling relationships are among the most formative in shaping who you are as a person. Even in adulthood. So that new film, Your Sister’s Sister? Yeah. It’s on my list. 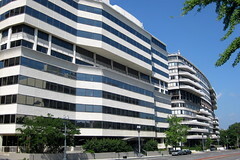 Image: Washington DC- Foggy Bottom: Watergate Complex by wallyg via Flickr under a Creative Commons license. Organizing and clutter control. I read how-to articles on this all the time even though I am the most organized person in the world. It’s fascinating. Twins, Triplets, etc. Do multiple births interest everyone, or is it just me? Completely obsessed with multiple births as well. Thanks for weighing in, Maureen! Welcome to the Watergate obsession club, Jen. I think you will like this article if you haven’t seen! What a wonderful topic for a post! Most (but not all) of my obsessions – may I substitute the word “passions” instead? – revolve around words and part. All things language and writing (including specific foreign languages) are among them (as they are for you), and all things to do with art, especially modern and contemporary, with certain periods (and genres) leading the way. I’m happy to say that I continue to acquire new passions, which I consider a good sign. So many of us thing that as we grow older our capacity for curiosity (and learning) will dwindle. I’ve discovered that simply doesn’t have to be the case. Oh… And must I add… shoes? Social Networking. Its effect on humanity. The stages of life. Youth through old age. The characteristics of each generation. @val thanks for chiming in. Dog behavior…hmmmm. Can’t say I share that one but intriguing nonetheless. Totally with you on stages of life though….